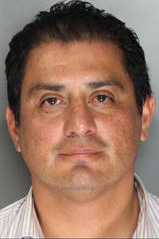 August 22, 2014 (San Diego’s East County) – State Senator Ben Hueso, a Democrat whose district includes large portions of East County, was arrested at 3:30 a.m. in Sacramento for driving under the influence. The California Highway Patrol said Hueso was driving the wrong way on 15th Street in his Ford Excursion when he was stopped, Fox40 TV reported. He faces charges of driving under the influence of alcohol with a blood alcohol content of .08 percent or more. The Los Angeles Times indicates Hueso attended a Latino Caucus dinner, where alcohol was served, before his arrest. Bail is set at $1,482, according to Sacramento jail records, and Hueso is slated to appear in court next week. Raised in Logan Heights and a son of immigrants, Hueso previously served in the Assembly and on San Diego’s City Council before winning election to the State Senate in a special election in 2013 to fill a vacancy left by Juan Vargas' election to Congress. Hueso's40th State Senate District, which is 67% Hispanic, spans three counties (San Diego, Riverside and Imperial). In San Diego his vast district sweeps from Coronado and the South Bay communities of Chula Vista, Imperial Beach and National City eastward through Bonita, encompassing Boulevard, Campo, Jacumba, Potrero and Mount Laguna in East County. "I am truly and profoundly sorry for the unacceptably poor personal judgment which I demonstrated last night. As someone who cares deeply about the public safety, I sincerely apologize to my family, my constituents and my colleagues in the Senate for breaching the trust they've all placed in me. I accept complete personal responsibility for my actions and any punishments that ultimately come my way as a result of this incident. I will also engage in immediate, corrective actions to ensure this kind of personal conduct is never repeated."